Christ Episcopal Church was founded July 28th, 1833 when eighteen residents of Gilbertsville signed a document as “those desiring to be formed into an Episcopal Society.” They called Deacon John Vaughn Hughes from nearby New Berlin to lead the new church and he immediately took charge, holding services in the old stone schoolhouse, now the village library. Mr. Hughes had arrived from England trained for the Methodist ministry, and not finding many of that persuasion in this country, Hughes was persuaded to turn to ministry in the Episcopal Church and ordained Deacon in 1832 by Rt. Rev Benjamin Onderdonk, Bishop of New York. 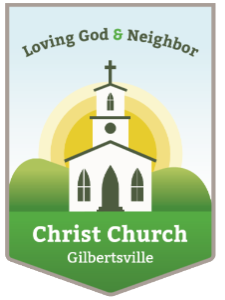 He set out for New Berlin and St. Andrew’s Church and the following year was called to Gilbertsville. Under Deacon Hughes’ leadership the members resolved “that an immediate attempt be made to collect funds to build a place of worship.” A cornerstone of the present building was laid in 1834. Christ Church was consecrated by Bishop Onderdonk on June 10, 1835 and the ordination of John Vaughn Hughes took place the following day. Priest Hughes continued his ministry here and the surrounding area until his death in 1877. There have been forty one Rectors of Christ Church, and several capable and beloved Deacons that have guided the Parish in times when the cure was vacant. The interior of the church has been changed several times, including a dark red and green scheme, murals with Biblical themes and the current simple, yet elegant, Puritan style, with brass chandeliers, plain furnishings and clear glass windows. The exterior has seen changes as well, from Victorian bric-a- brac to the current traditional steeple over a white church. A Parish House was added in 1955, and contributes significantly to the many ministries supported by the Parish. The church building as well as the accompanying Rectory and barn are included, with the entire village of Gilbertsville, on the National Register of Historic Places. Gratitude is extended to Douglas McKee, author of A History of Christ Church Parish for much of this abbreviated version of his work.